Basis for a Europe wide electricity and charging station network & the development of autonomous traffic. 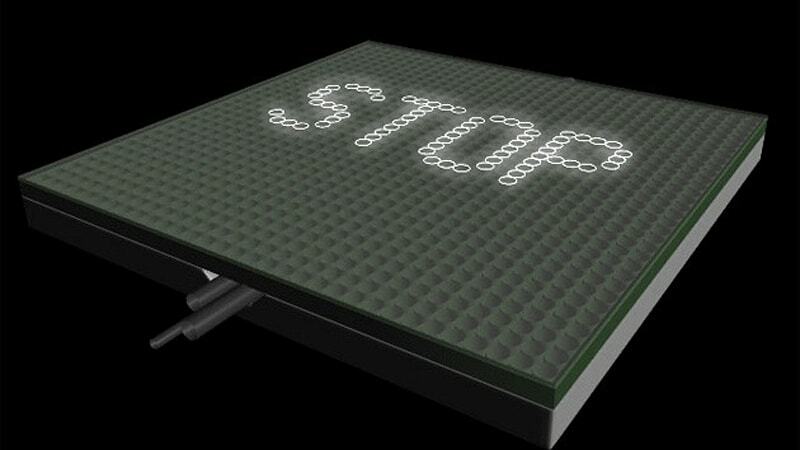 Modular Composition System (MAS) invented by PolyCare Research Technology GmbH & Co. KG. All Rights reserved. Electrode layer chip, scales, sensors, GPS (or similar) etc. Provides autonomous & half-autonomous vehicles the possibility to receive & read data regarding other vehicles, objects, traffic rules, weather etc. We have to build it. To build digital a road system the current road needs to be completely re-thought. 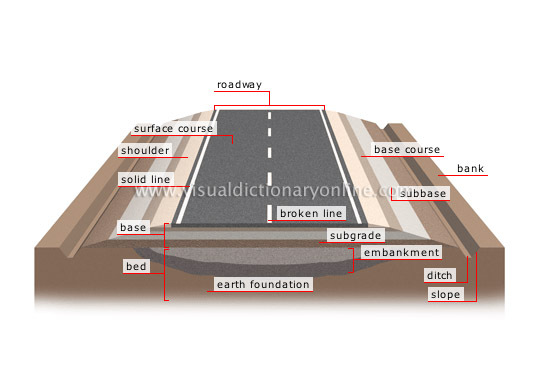 Today a road is made of some tar and or bitumen surface, which is founded with sand and stone. The surface is hard, the road system it makes up does not support any other purpose than being a road. The cost of building, maintaining and renovating these roads are high. The road consumes energy. The road system costs money. It doesn’t generate it. The new ways for Europe are different. It starts with the fundament the road lies within. 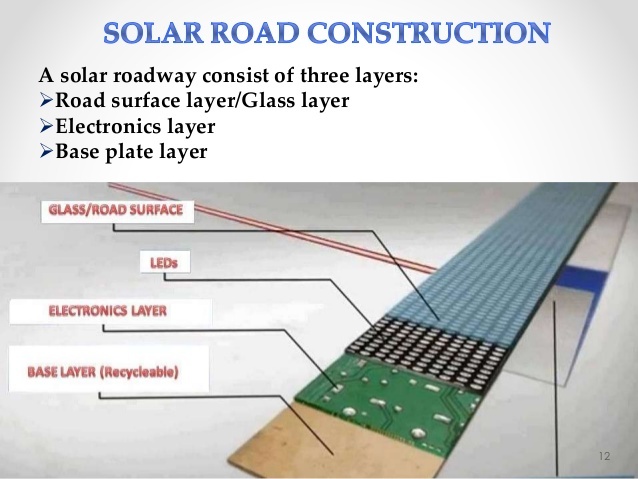 The inventors of Solar Roadways had a great idea. 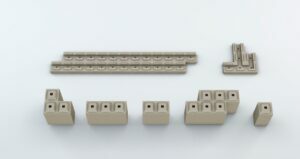 For their prototype road of modules, they incorporated a cable corridor into the concrete base on which the road lies. 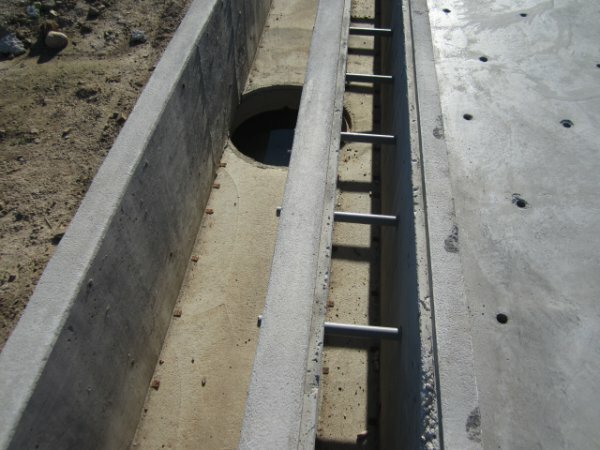 It can be used as drainage for surface water or shaft to lay cables. Why would you want a cable corridor at the sides of a road? 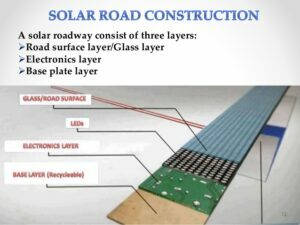 A cable corridor on the side of the road makes the fast and non-immersive laying of glass-fiber cables, electricity (high and low voltage) lines, drinking- and waste-water as well as gas pipes, their exchange and maintenance easy and cheap possible. It would mean that we use our roads multi-functional. They would not only provide a surface for transport and traffic, but also the possibility to carry our energy, gas and water supplies and the communication lines. Instead of digging chambers through the environment or building dangerous pylons and transmission lines, which kill millions of birds each year the new ways for Europe use the European road net as an already existing grid and transforms it into an innovative supply network for the whole continent. To build a road with a cable corridor or a chamber changes the design of the base. From a flat base which lies on a subgrade and a bed, the base is now extended. 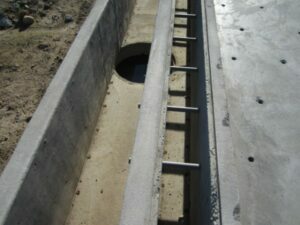 It get’s two side chambers to carry cables or to function as a drainage. 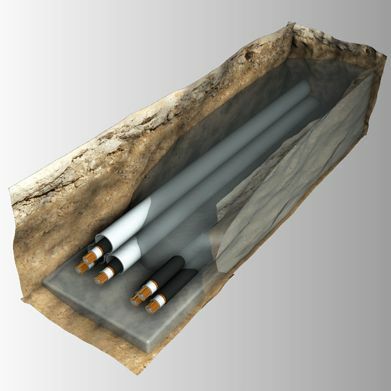 Powercrete® by Heidelberg CementGroup – The concrete with high thermal conductivity to lay high-voltage underground cables. 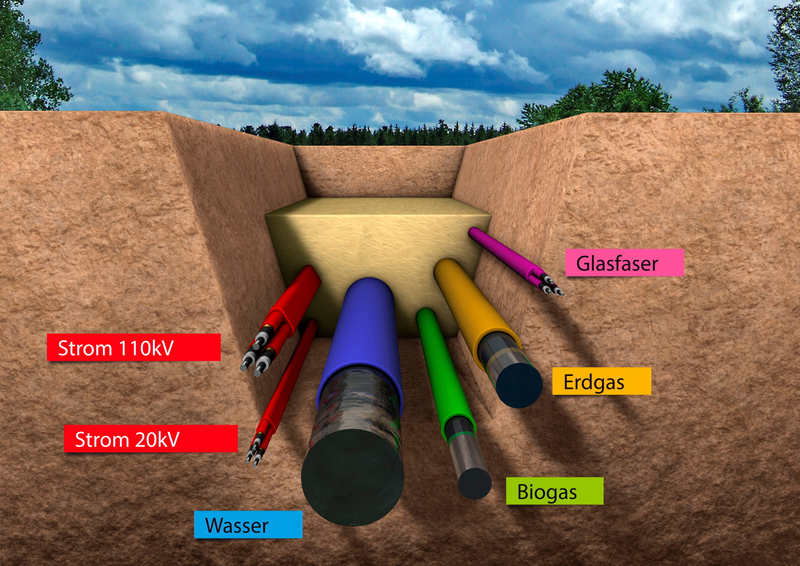 The second chamber is needed if the road is supposed to function as a carrier for high-voltage buried cables. Due to the electromagnetic fields and the heat the cables carries, while transmitting the electricity, they can not be taken in the same chamber as all other cables and pipes. Instead, the high-voltage cables have to be embedded in liquid soil. Both chambers have to have a minimum depth of 1,5m-1,7m to cause no harm to the environment above the surface and the road modules and to lay safe. As the electromagnetism and the heat of this construct is a challenge to construction. The liquid soil solution is supported by the way and the material of which the base is build. Modular Assembly System (MAS) invented by PolyCare Research Technology GmbH & Co. KG. All Rights Reserved. Poly-Care Research Technology invented a polymer concrete which is formed similar to LEGO-stones and can also be pressed in other useful forms. These polymer concrete stones are free of cement and don’t need typical construction sand. They can be made of a diverse range of material. Some of these materials could be heat and or electromagnetism containing materials which protect the surrounding environment from the effects. One of the great innovations of Poly-Care is that their stones can be produced with a mobile production factory. This mobile production plant can use the existing materials, which could be parts of the old recycled road. 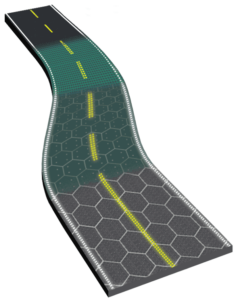 Build a road system which is able to interact with all traffic actors. 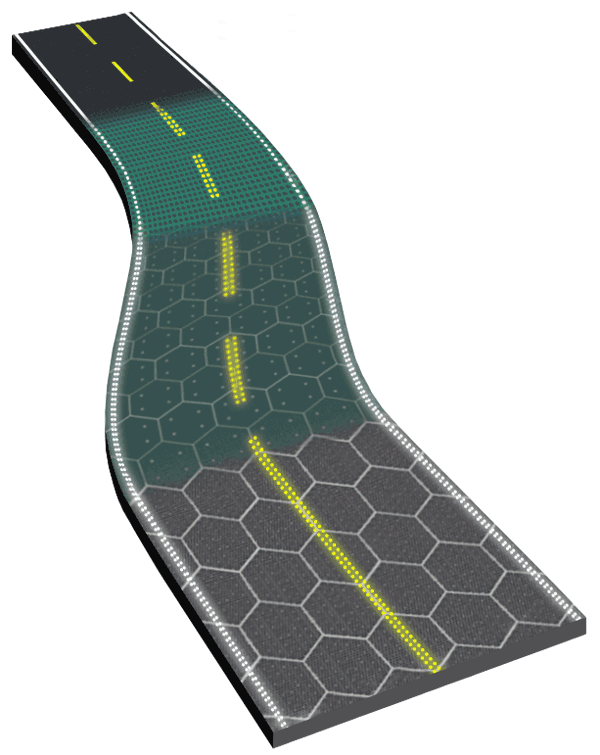 Make it the single multi-layer grid for transport, electricity, water and communication. Let it pay for it-self from the day of the go-live. The current situation in the European Union, on the European continent and within the neighboring countries is worrying. Not only does it look like our political establishment is shivering of fear due to extreme movements of different backgrounds, but also does Europe becomes less and less the place for investment. The lack of investment leads to a lower standard in economic competition, which then leads to higher costs for fighting brain drain. This leads to lower willingness to pay accurately for non-high-profile employees. The lack of income of this group leads to a lower consumption capacity, which triggers social discomfort, which leads to extreme movements of different backgrounds, which leads to lack of investments. The vision life-cycle is the fundament of every healthy investment culture. It shows how investment can be triggered and what it will deliver. Perspective is the vision of the future which is perceived by the people living in the described region. A negative perspective triggers unreliable but decreasing consumption rates, which lead to lower willingness to invest. One could say, that dooms-day for the economy would be the day when Europe becomes a fragmented and autocratic, fully bordered disenfranchised society. In economic terms this would mean that there would be no consumption to trigger. As consumption today is based on the behavior of the individual personality developing customer, a disenfranchised society means that the personal development of the individual customer is not happening. Which means that if there is no personality to develop, there is no consumption to trigger. If there is no consumption to trigger, there is no growth. A positive perspective triggers – like sunlight – the common feeling that times will become better or are to stay good in the foreseeable future. They trigger the willingness to invest and level up consumption rates. A positive perspective allows to develop ideas which are solution orientated instead of fighting about symptoms. Well-developed ideas are the base of well informed and sustainable decisions. These decisions are the framework for the roadmap to put a positive perspective regarding the implementation. 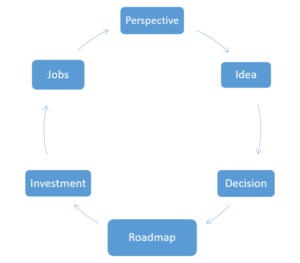 A sophisticated and realistic roadmap, is equal to a qualified opportunity, it says “The deal is there!”. This is when a positive perspective triggers investment, which then triggers the creation and preservation of jobs, which again lead to a better perspective. The current situation does pretty much look like a negative perspective. 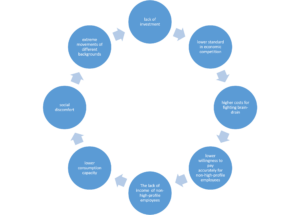 It is therefore that this blog will bring up a positive perspective on how to get out of the vicious circle of losing money. The focus of this blog lies in the public promotion of solutions which help to re-invent the technical, economic and digital landscape of the European continent as a whole. The goal is to ease the political public sphere by bringing employment ready people all over the continent back into sustainable, demanding jobs. To create a founded environment for sustainable investment.